Where do I even begin?! This wedding was so spectacular from the start, from Ben and Meghan to all of their guests. I was so honored to shoot this wedding with Jennifer Simpson Jennifer lynn photography. This is a wedding Maine wedding photographers would love to get their hands on. Couples always plan their wedding day with new wedding ideas and discovering new trends that fit their style, they look for the best wedding favors and the most appealing customized guest books. They spend months planning and prepping for the perfect day to ensure everyone has a great time, things are aesthetically pleasing and they get the best images to truly capture the love that day. This is always how the process begins and I am sure it went the same way for Ben and Meghan. See, Ben and Meghan decided to get married at the Holy Family Church in Old Town, Maine and have their reception in Meghan’s parents backyard in Milford, Maine. They also planned out their wedding with those creative wedding ideas that would make their day perfect. There is a moment this all didn’t seem to matter as much, I’ll get to that. Ben spent his morning with his groomsmen getting ready at the UniversityInn in Orono, Maine. What a great group of men, they all spent their time getting ready, laughing and reminiscing of their college days and truly enjoying their time together. I could tell Ben was enjoying being with all the people he considered dear to him. However, I also could see the anticipation of seeing the love of his life walk down the aisle and all the various questions going through his head, What would she look like? Will I hold it together? etc. After we finished the groomsmen pictures we were on our way to the church. Once we arrived at the church everything happened so fast, next thing we new the guests arrived and were seated and it was time to start the wedding. There Ben stood at the alter smiling as all the groomsmen and bridesmaids walked down the aisle and then came the moment we had all been waiting for. The moment those large doors swung open, everyone stood and looked at the bride and all her beauty and I turned to look at Ben and he had tears in his eyes. This was the moment he had been waiting for, and there she was the person he was going to spend the rest of his life with. 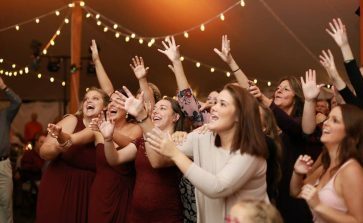 These are the moment Maine wedding photographers live for, these are the moments why we chose to be wedding photographers. This wedding was epic! The reception was over the top best reception EVER! Everyone was dancing, laughing, signing, and celebrating Ben and Meghan’s day. If I could do this wedding all over again I would in a heartbeat, this is the wedding wedding and portrait photographers live for. The couple were electric together, their chemistry was so stunning, they were just natural in every single image taken. What an honor to be apart of this special day. These are the moments you never forget. To see others see the wedding gallery. WHOSE READY TO GET MARRIED NEXT? Let Catherine J. Gross Photography and Jennifer Lynn Photography document your special moments.